I didn’t expect to love this—the sticker on the front said I would, but I was sceptical. With everyone jumping on the dystopian bandwagon, there’s so much out there, plots overlapping, making it all fairly unoriginal. Adding in vampires—or at least, vampire-esque people—I’d be remiss not to say that I wasn’t going into it with the biggest of expectations. But somehow, The Hunt snagged me—I could hardly put this one down! It was like Rachel Caine and Suzanne Collins had gotten together, leaving behind this little baby Fukuda in their wake. With such descriptive creativity, and a perpetual fear of dismemberment, he had me scratching my own wrists, but for completely different reasons. 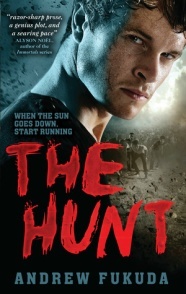 Knowing that the main character was going to be picked as part of the hunt, I was glad the book didn’t spend to long getting to that revelation. Instead, we were introduced to his life, and the daily struggles he went through in order to pretend he wasn’t human. Not only did his physical behaviour alter, but so did his mindset. I really liked that. It added a believability to the character, that his world had moulded within him a certain way of thinking, even if he’d tried to remain true to his origins. In an interesting turn of things, humans—or at least the term—were unheard of—they were known as hepers, and the vampires, they were considered people. Rather than having regular chapters, the book was split into chunks based on the periods of time leading up to the hunt. It makes it hard to find a good place to stop when you’ve got something like seventy pages between sections. Evil. With lots of lead time, the book centres on the build-up rather than the actual event. It works though. The tension grows with each page, getting closer and closer to being found out for what he is, and a certain death. Meeting the people who would be the ones to kill him, spending his days putting off the inevitable, trying to figure out a way to save his flesh—it was surprisingly addictive. The romantic interlude didn’t do a lot for me. The introduction of another character was probably needed after the introspection we’d spent the majority of the book in, but the quasi relationship didn’t excite me, or seem important in retrospect. It would have been better had it played out…I can’t finish that sentence without alluding to a spoiler. I can however say that I appreciate the author’s ability to stick to what he’s done and not always take the easy outs—things go wrong, characters struggle with their decisions and doing the right thing isn’t always the right thing to do. The actual hunt wasn’t the highlight of the book for me. I just thought it lacked something. It was too short for one thing, but also, it just didn’t seem to hold the level of gravitas that it should have. Still, it kept up the pacing, leaving me with that edge-of-your-seat feeling. With room for a second book, I’m hoping it will expound the heper mystery even further and bring more action-fuelled confrontations to the forefront. Dystopian fans who want a paranormal infusion. I know what you mean. I wasn’t a fan of the romance in this book and I found it was lacking something . . . not sure what though. Anyway great review!